Alice Yeh: Talk of persecution and extinction often accompanies media coverage of Christians in the Middle East. What intervention does your book contribute to this conversation and what assumptions are you arguing against? Angie Heo: Without doubt, Christians in the Middle East confront horrific incidents of violence – bombings, torchings, abductions, murders – that hit the headlines on a numbingly regular basis. These tragedies understandably lead to anxieties and fears that Christians and Christianity are on the decline in the Arab Muslim world. The irony is that social imaginaries of persecution and extinction are also the very stuff of Christianity in current contexts. Persecution politics rely on aesthetic tropes of martyrdom and suffering. Rhetorics of extinction compel the collective memory of founding origins. During my fieldwork among Egypt’s Copts, I became convinced that marginalization and violence did not so much extinguish minority traditions as they activated and reactivated them toward various political ends. 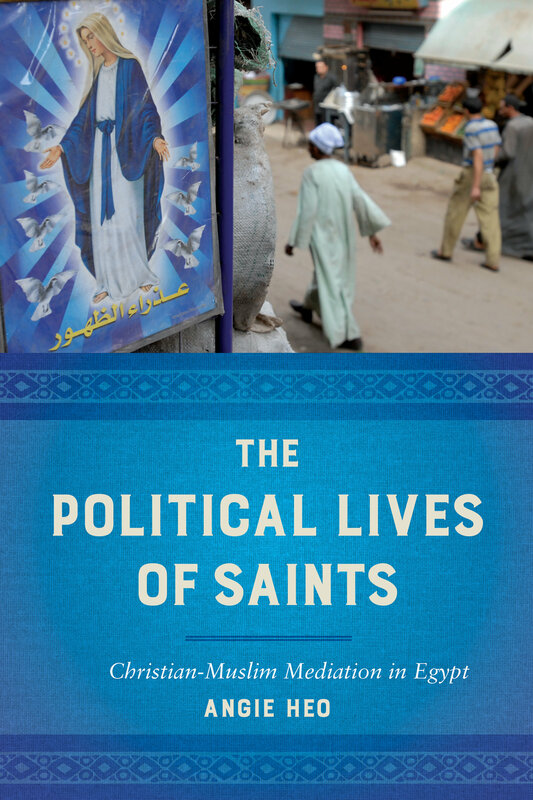 My book shows how Coptic Orthodoxy serves as a central medium for governing Christian-Muslim relations in Egypt. I found that saints – the Virgin, martyrs, miracle-workers, mystics – invite a form-sensitive analysis of communication between Christians and Muslims. Saints and their imagined representations touch on classic anthropological themes such as personhood and materiality, and they also build on recent debates around religion and/as media. Perhaps most of all, I saw that tracing the semiotic intricacies of divine communication afforded more empirical purchase on the linkages between religious and political mediations. I believe this is especially important when working on saints and shrines – a topic that often appeals to romanticized pasts and other-worlds that circumvent structures of modernity. I hope my book does justice to the ways that cultural expressions of holiness flourish and transform in relation to complex politics of authoritarianism, inequality, revolution, and bloodshed. Alice Yeh: I want to ask a question about the structure of the book, and its organization into three parts (relics, apparitions, icons). One effect is that, as a narrative, the book describes the increasingly sophisticated semiotic technologies by which saints are made accessible to others. Why did you organize the book this way? Do these techniques build one upon the other or do they develop in tension? Angie Heo: Thanks for this most thoughtful observation. I am happy to hear it because crafting my book’s organization was a source of weird obsession and pleasure; your recognition that there is a narrative structure in it is so gratifying. When I was planning my book’s flow, I decided to focus on the religious terms of belonging to the Christian community and to the Christian-Muslim nation. My ethnography begins with holy origins (in other words, “life-in-death”): the Coptic Church’s origins in martyrdom, through St. Mark of Alexandria and during New Year’s Eve of the 2011 uprisings. I chose to open with the relics and how they mediate loci of divine passion, sacrifice and resurrection, ultimately, the ritual exchange of violence for justice. My ethnography closes with holy departure (that is, “life-after-death”): the canonization of saints, through holy fools and mystics, and the creation of eternal memory. Here, the icon is my medium of choice, and I trace how icons mediate holy personhood and the temporal dynamics of disappearance. On the point of the book’s cumulative arc, yes, I do understand that the semiotic technologies that I describe build on each other — relics, apparitions, icons. I am not sure that I would say that they are increasingly sophisticated, but I definitely see them as interconnected modes of reproduction and circulation. Essentially, I wanted to move away from the idea that relics, apparitions and icons are particular types of “things” or image-objects, toward considering them more as distinctive styles of material imagination that are subject to historical transformation. These three genres of imagination involve different sensory ratios (combining the visual, tactile, auditory) with different effects on making the space and time of saints. For all their differences, relics, apparitions and icons are also inter-related media of representing and disseminating presence that work in intimate tandem and blend into one another. I think where you can best see this blending effect is in the transitions between my book’s three parts: between chapters 2 and 3, it is Saint Mark’s relics that operate with the Virgin’s apparitions in a political economy of territorial returns; between chapters 4 and 5, it is a dream-apparition of a Virgin that translates into a miracle icon’s power to reconfigure the public. Your proposal that relics, apparitions, and icons develop in tension to one another is quite stimulating. While I have devoted my energy to thinking about the continuities between these semiotic technologies, I have done much less work on considering the tensions between them. If I could write a second version of this book, with all the same fieldwork materials but another entire analysis, I would take this question up. It would be a really interesting exercise to see how the relic-form poses a challenge to the icon-form, for example. The arbitrary quality of what analytic direction an author chooses to pursue and not pursue is what makes scholarship feel so infinite and full of possibilities! Alice Yeh: Can you elaborate on the paradox of “mystical publicity”? Are there non-Christian or non-religious contexts in which it manifests? It just so happens that I am teaching a bunch of texts this quarter that trace the mystical and ascetic strands of moral personhood in other traditions. There are Sufi mystics hiding away in Hyderabad and Delhi, “Gandhian publicity” with its ascetic management of bodily energy, and of course, the Jewish Kabbalah which appeals to an occult cosmology of knowledge and power. Reading Eastern Orthodox theological writings on the holy icon, I was completely floored by how much ink, century after century, has been spilled on the divine status of images and the fatal risks of idolatry. When I did my fieldwork, I was also taken by the way that monks and nuns looked away from cameras when we were taking group photos, which got me reading up on holy fools and the desert anchorites – on social imaginaries of withdrawal, self-effacement, and death. If you check out my footnotes, you may notice that I also try to link up the Orthodox tradition to ancient Greek ethics of cynicism via Sloterdijk. My last body chapter’s epigraph is also a quote from Goffman’s “On Facework”, a classic piece whose first footnote is a fascinating orientalist reference to Chinese concepts of face and saving face. Not incidentally, it is also an essay that motivated MacIntyre’s charge that foundational nihilism lay behind Goffman’s sociological method. In the broadest sense, I suppose I am making a claim here about the nature of the religious / non-religious distinction within the work of concepts. One could argue that mystical thought and practice has been a crucial resource for deconstruction and poststructuralism; I am thinking of Derrida’s disavowal of metaphysics and de Certeau’s ontological commitment to traces here. Continental philosophy and American sociology also inherited, at least in part, a canon of core terms that have defined the status of the human, and the divine/ human limit, in religious traditions. Secular humanism may be presumed in mass industries of celebrity and in the consumption of imagined persons. However, the moral perils of mass popularity, such as “losing one’s self” or “turning corrupt”, also deeply resonate with the millennia-old mystical impulse to retreat and just disappear from the crowds. Alice Yeh: One especially interesting observation is that institutionalized Christian-Muslim sectarianism is more the consequence of a shared rather than oppositional religious imaginary. For example, you write about how Muslim eyewitnesses are crucial to authenticating a Marian apparition. How are these eyewitnesses located in the construct of “the simple people”? How do “the simple people”shape cross-confessional practices of witnessing? Angie Heo: One of my book’s main arguments is that sectarian division is intrinsic to imaginings of Christian-Muslim nationhood. My claim here is really directed to long-championed formulas of “nation above religion” that are based on an ideological opposition between national unity and sectarian difference. To break past the opposition, I begin with questions of communication, or “commonness”, to expose the formal continuities between national and sectarian imaginaries. This is where I see semiotic approaches and resources in linguistic anthropology to be very helpful. In each of my chapters, I explore the question of communicative form, or what is presumed to be shared and not shared between Christians and Muslims. When I analyzed relics and apparitions, I focused on the communicative terms of a sacred territory, whether it is imagined as a divinely blessed Holy Egypt (national) or as a church in competition with a mosque (sectarian). When I analyzed apparitions and icons, I examined the communicative terms of a moral public, and the ways in which a collective subject comprised of both Christians and Muslims (national) create structures of communal identity and secrecy (sectarian). Anybody who has spent significant time with Copts will have likely heard the adjective “simple” (basīṭ, basīṭa) or the phrase “the simple people” (al-busaṭāʾ). In Egypt, “simple” can be a subtle geographic reference to Upper Egypt, and in the Arab world at large, “simple” can also connote the urban working classes (here, I must credit Abdellah Hammoudi for pointing this out to me). During my fieldwork in both rural villages and industrial neighborhoods, I discovered that the term “the simple people” also expressed some kind of moral credibility among Copts: “Those villagers are too simple, they wouldn’t even know how to torch a church!” (chapter 6); “The Muslims who reported seeing the Virgin are simple people, unlike those who denied her who are motivated by their self-interest.” (chapter 3). Judgments like these are curiously ambivalent. They revealed how the quality of simpleness signified both the power to transcend sectarian identity and the guilelessness to ward off allegations of violence. I became utterly fascinated by invocations of “the simple people”, especially since saints are also frequently praised for being simple. If simplicity is a virtue, then I had to study the image of “the simple people” – the trustworthy public and its credible opinion – as a key protagonist in the story of making saints. Alice Yeh: What specific challenges or conveniences did the turn to identifying relics, apparitions, and icons as genres of mediation pose for your fieldwork? What advice would you offer to students with related interests? Angie Heo: I have a zillion answers running through my head, and I think it’s because I am imagining many different audiences reading this. To students interested in materiality studies, I am committing to one brief piece of advice, for what it’s worth. Resist taking the object for granted. This seems like an elementary point, but I am always surprised by how often some “thing” is presumed to be a relic merely because it is a body-part of a holy figure or because it is a fragment of a lost past. I approach relics, apparitions, and icons as genres of mediation, and not as already-given types of objects, because I see my most interesting work emerging from a curiosity in how persons and things are recognized as such in the first instance. Like it did with numerous thinkers from Marx to Munn, this somewhat dissatisfied curiosity drove my constant doubt in my inclinations to naturalize images into “things.” And I am grateful for what the curiosity and doubt together allowed me to question and see anew. Perry Sherouse: In your article in George Marcus and Dominic Boyer’s volume on collaborations, you write that “comics – far from “dumbing down” or “simplifying” concepts, could be used to layer on more complexity – through comics, we could play with scale, time, and place.” What complexities of language and place were both of you able to convey in this format that would have been flattened or omitted in a standard, text-only account? Perry Sherouse: When considering how to include citations to revolutionaries in this visual format, you were careful to think about the politics of representation. How does graphic ethnofiction change the way we think about the aesthetics and politics of citation? Sherine Hamdy and Coleman Nye: We were drawn to the potential of the graphic novel form to reach a much wider audience — and in so doing, to re-conceptualize what counts as knowledge. It was important for us to cite the work and insights of the revolutionaries which were being produced in ways not generally accepted as “scholarship” — like social political commentary on graffiti throughout the public walls of Cairo and especially in Tahrir Square. We heavily visually cite Egyptian graffiti artists and even had a full-page mural designed by Ganzeer as a way to acknowledge our indebtedness to them in our own approaches and understandings of the revolution, and to signal a wider range of what counts as intellectual contribution. The revolutionaries who were present, in the Square and the streets of Cairo fighting off tear-gas, protecting protesters from military or police violence — they too were contributing to our theories of what counts as political action. Similarly, the doctor-volunteers who set up make-shift “field hospitals” in a city not technically at war — they reconceptualized the idea of “medical neutrality” and impartiality. By having Layla work with Tahrir Doctors in the story and by interviewing real people like Drs. Amr Shebaita and Dina Shokry, getting their feedback on the story, and incorporating them in the book as characters who play themselves, we wanted to acknowledge their political action as a key intellectual contribution to the Revolution, as well as to our book. The comic form allowed us to do that in a novel and exciting way. Coleman Nye and Sherine Hamdy: Art Spiegelman’s Maus is an obvious inspiration for its novel use of the comic form to deal with the very serious events of the Holocaust and its aftermath. Persepolis too was wonderful in that it opened a window onto the Iranian revolution through the eyes of a young girl. These influences are probably not “undetectable”! But since neither of us had grown up on comic books as kids, these works opened up the possibilities of what comics could portray and depict. We wanted to extend that work by making it really obvious how it connects to traditional academic scholarship, which is why we mapped out the connections in the appendices. It’s definitely unconventional for comic book producers to provide “teaching material” to accompany their stories, and may even be off-putting for some, in a way that it calls attention to what is ordinarily buried within the story, but we wanted Lissa to break through to academics and provide something of a bridge between the comics and academic world. Perry Sherouse: Where and how do you write (for example, in a houseboat with a pencil, in bed with an iPad, underground cave with charcoal)? What is essential to your creative process separately, and collaboratively? Sherine Hamdy and Coleman Nye: This was a funny project because so much of the collaborative writing took place long-distance. Sherine was on the East Coast and Coleman was on the West Coast for all of the early script-writing, which took place in chat and via Skype on a shared google doc. And toward the end, we had one artist on Mountain time and our visual editor Marc Parenteau working from Mongolia, so the coordination was nutty to say the least. But there were wonderful moments of collaborative writing and drawing: in Egypt, we talked through the plot and character design in a range of places, from street markets to meetings with medical students; in Providence, Coleman and Sarula sat in a coffee shop trying to talk/sketch the gene patenting page; and our favorite – Sherine hosted Caroline at her house for a week, while feeding her Egyptian food and modeling different facial expressions for her during the final push of art production.